In all the world's wisdom, it still didn't know God...so he sent PREACHERS! What was God thinking? At first blush it doesn't seem like a terribly effective method of getting the Word to people. At least not in this day and time. "Preaching" has changed a lot over the years, especially over the last 100 years. I wonder if we really know what the Scriptural model for preaching is any more. I am truly convinced that if preachers followed the Biblical model for preaching, it would be far more effective. To start let me make a distinction between preaching and witnessing. Witnessing is how you interact with sinners on a daily basis. Jesus had many commands on how to show kindness and love to those who don't know Him. He ate with them and showed compassion on them. He lived an example. Preaching is a specific function that God uses to warn sinners of His impending judgment and it's results, and to offer the gift of salvation through repentance and belief in the redemptive work of Christ on the cross. Let me also make a distinction between preaching and teaching. Preaching is primarily what is done for the benefit of the lost whom we are attempting to reach with the Gospel. Teaching is primarily the Word as it is given to those who are saved and are being edified and matured by it. While those may not be hard-and-fast definitions, they are generally accurate and will suffice for the sake of my points on preaching. I am discussing the way that God's Word is preached to the lost. 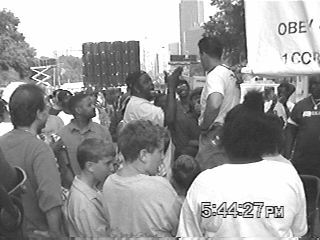 The most popular method of preaching is the type popularized by Billy Graham. Those of us who are street preachers call it the "God Loves You and Has a Wonderful Plan For Your Life" preaching. Sinners are told that "Jesus loves you. He accepts you just the way you are. Invite him into your heart right now. That's all you have to do. Believe and profess His name right now and you will be born again." This of course is followed by "With every head bowed and every eye closed...Come down to the front right now. Your friends will wait. Don't worry, the buses will not leave". Hundreds, sometimes thousands of people stream to the front of the auditorium as "Just As I Am" plays over the sound system. What becomes of these thousands and thousands of "converts" over the years? You might think that after all these thousands coming forward, we would have had a major revival in the U.S. by now. What gives? The answer may surprise you. According to the Billy Graham Evangelistic Association, only about 10% of those making a profession of faith at a Billy Graham crusade are regularly attending church members one year later. That's right. Just ten percent. What's the problem? Is it the messenger, or is it the message? Or did the Holy Spirit goof up somehow? The Bible has a pretty basic model for preaching. It can be summed up in two words, REPENT and BELIEVE. Now you might think that this smacks of old-timey fire and brimstone preaching that is outdated and, well, FOOLISH. Guess again. Matt 3:2 And saying, Repent ye: for the kingdom of heaven is at hand. But, you might say, doesn't God love everyone? That's why He sent Jesus, to redeem the whole world. We all know that God hates the sin but loves the sinner, right? Not really. Actually, the Word clearly says that God HATES some people. That's right. HATES. And furthermore it is acceptable to hate the enemies of God (not YOUR enemies). This is not an emotional hatred, but a strenuous opposition. I know this sounds radical according to modern Christian teaching, but when in doubt, let's go back to the Holy Word. 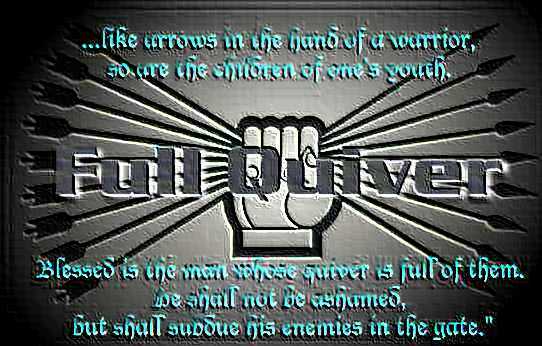 Psalm 5:5,6 The foolish shall not stand in thy sight: thou hatest all workers of iniquity. Thou shalt destroy them that speak leasing: the LORD will abhor the bloody and deceitful man. Psalm 139:21, 22 Do not I hate them, O LORD, that hate thee? and am not I grieved with those that rise up against thee? I hate them with perfect hatred: I count them mine enemies. So we find that God loved "mankind" (His creation) so much that He wanted to redeem us, but He hates individual sinners. Preaching should reflect this. In other words, preaching should be the warning of the wicked from his way; letting him know that he is a disgusting and filthy sinner in the eyes of God. But that in spite of that, God is giving him the opportunity to REPENT and turn to God if he believes in His death, burial and resurrection-His redemptive work on the cross. But be it known that He requires holiness (be ye holy even as I am holy). He is a "jealous God that will have no other Gods before Him". And if you continue to "willfully sin after receiving the knowledge of the truth, there is NO MORE sacrifice for sins, just a fearful looking forward to of the fiery indignation that God has reserved for his enemies" (Hebrews 10:26). Instead of this, people are being told that they need only "believe and confess the name of Jesus"; that Jesus loves you so much He made it that simple. Folks converted under this preaching are looking for what God will do for them next, not what God REQUIRES of them. They want Jesus to be their best friend and lover, they don't want to be His sold-out slave. It truly is a fundamental difference. In truth, He wants us to be ALL of that. Most of the sermons in the Bible are in the Book of Acts. NOT ONCE is the love of Jesus mentioned in any of those sermons. But repentance is mentioned in virtually all of them. What about "name-calling?" Is it right for preachers to get on the corner and call people "wicked sinners, fornicators, sodomites, adulterers", etc.? The apostles did. "And God added to the church such as should be saved." For those of you who think that the Old Testament verses I quoted are not relevant to New Testament preaching, we'll clear that up now. The Scripture Paul is referring to of course is the Old Testament. It was the only Scripture they had. Here, Paul goes into specifics about HOW one should preach: REPROVE, REBUKE and EXHORT. Most of us only understand in a general sense what these words mean. Let's take a look at the word "reprove" in the Greek. It is an extremely strong word. Paul is basically saying that when you preach, "find fault with them, reprehend them severely, warn (admonish) them, chide them, show them their faults, bring shame on them". Obviously this is done along with the message that if the sinner DOES repent and turn to God he will be saved and experience the "times of refreshing". But there are no instructions about the "love of Jesus". He is also saying that ALL SCRIPTURE is profitable for reproof as well. Many modern translations say "expose" rather than reprove, but the Greek word is the same, with the same strong meaning. We should not only avoid fellowship with these works, but should warn, bring shame on, reprehend severely, chide, call them to account and show them their faults". But doesn't that kind of preaching just bring ridicule and arguments? Sometimes. But it also gets people's attention. Nobody thinks of himself or herself as evil. Very few think of themselves as God-haters. They will almost always stop to defend themselves against this kind of preaching. You have a captive audience for a time anyway. Is it wrong to argue with the wicked? Nah. Prov. 28:4 They that forsake the law praise the wicked: but such as keep the law CONTEND with them. Many preachers want to be "nicer than God" when they preach. I feel no such responsibility. 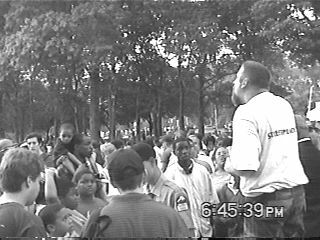 Preaching in the open air is really the only way to reach those that will not walk into church to hear the gospel. And in 99 churches out of 100, they wouldn't hear what they needed to hear in church anyway. The Apostles are recorded in Acts as ARGUING with people as a method of preaching. Acts 17:17 Therefore disputed he (Paul) in the synagogue with the Jews, and with the devout persons, and in the market daily with them that met with him. Acts 19:8 And he (Paul) went into the synagogue, and spake boldly for the space of three months, disputing and persuading the things concerning the kingdom of God. In the first verse above, we see that Paul not only preached to the Jews this way in the synagogue, but also "in the marketplace". This is the chief concourse, the place where the largest possible audience could be found. They used the same method of preaching in the synagogues, in the marketplace and in the schools. I have been accused of "name-calling" when I preach. I will sometimes call people fornicators, sodomites, etc. This is not name-calling in the sense of being hateful or derogatory. It is an effective and Biblical way of making the sinner understand that they are being identified by the sins they commit. I preach on the street. I'm called a street preacher. If I were boastful, some would call me a braggart or an egomaniac. We are identified by our attributes. When I preach at the sodomite marches, I refer to those I'm preaching to as sodomites. That's what the Bible calls them I have no problem with that. Here is a list of some of the names that people are called in the New Testament. Some of these were spoken of religious leaders, some were spoken of ordinary folks. "SWINE" Matt. 7:6 "...neither cast your pearls before swine"
"O YE OF LITTLE FAITH" (Christ's favorite name for His apostles!) Mat.6:30, 8:26, 14:31, etc., etc., etc. "STIFFNECKED AND UNCIRCUMCISED" Acts7:53 "...stiffnecked and uncircumcised in heart"
"WHITED WALL" Acts 23:3 Paul to the high priest . Again, the purpose for this type of approach is for the sinner's benefit. He must be told that God requires him to REPENT and believe in Jesus Christ's redemptive work on the cross to be saved and escape the fires of hell. In the verses in the Gospels there is a persistent theme: If you do not REPENT, you will perish. It doesn't say you will perish if you don't believe (although you will obviously), the emphasis is on the repentance. Now I realize that all this goes contrary to what most of us have been taught about preaching. We all know how embarrassing it is to hear a street preacher out on the corner telling folks to "Turn or Burn", "Get Right or Get Left". But is that embarrassment because the method is wrong, or is it a problem with our own pride in our own hearts? I have laid out a case for it from Scripture. But let's also look at the witness of history. As I mentioned earlier, the Apostles NEVER preached about the "love of Jesus" or any such thing when they preached. Let's look at the Reformers and the Revivalists. Martin Luther preached vehemently against the notion that God "hates the sin but loves the sinner". 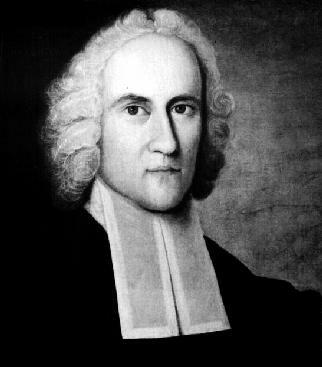 Of the Revivalists of the Great Awakenings, Jonathan Edwards, George Whitefield, and later Charles Finney all denounced the notion as well. They all taught that you cannot separate the sin from the sinner. God doesn't send the sin to hell, but the sinner to heaven. God "hates the hands that shed innocent blood." Does He just hate that part of the sinner's anatomy? Of course not. "So what? ", you might say. They could have gotten it wrong. After all, they're just a bunch of dead white guys. Maybe. Except for one thing. The Holy Spirit visited their preaching with REVIVAL! Massive, widespread, nation-changing, intercontinental REVIVAL. The fact is that there has NEVER been that kind of vindication from the Holy Spirit for the "God loves you and has a wonderful plan for your life" preaching. "The God that holds you over the pit of hell, much as one holds a spider, or some loathsome insect over the fire, abhors you, and is dreadfully provoked: his wrath towards you burns like fire; he looks upon you as worthy of nothing else, but to be cast into the fire; he is of purer eyes than to bear to have you in his sight; you are ten thousand times more abominable in his eyes, than the most hateful venomous serpent is in ours. You have offended him infinitely more than ever a stubborn rebel did his prince; and yet it is nothing but his hand that holds you from falling into the fire every moment. It is to be ascribed to nothing else, that you did not go to hell the last night; that you were suffered to awake again in this world, after you closed your eyes to sleep. And there is no other reason to be given, why you have not dropped into hell since you arose in the morning, but that God's hand has held you up. There is no other reason to be given why you have not gone to hell, since you have sat here in the house of God, provoking his pure eyes by your sinful wicked manner of attending his solemn worship. Yea, there is nothing else that is to be given as a reason why you do not this very moment drop down into hell. O sinner! Consider the fearful danger you are in!" Yikes! Doesn't sound like the "love of Christ" to me! How could you get revival from THIS? But the effect of that preaching was astonishing, and literally changed the spiritual makeup of America and ushered in sweeping reforms in law and culture. 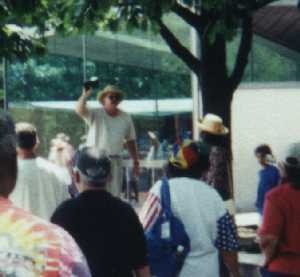 This is a photo of me preaching in front of the Liberty Bell on July 4th. The crowd was less than enthusiastic. People didn't want to hear about God's Holy Word and Law on their vacation. This sort of preaching is opposed by Christians more vehemently than anyone else. I have had Christians routinely stop to rebuke and chastise me for being "judgmental" and "un-Christlike" and "unloving." They listen to God being blasphemed by some of the onlookers. Instead of defending God against the heathen, they defend the heathen against me! The world (and the police) view it as "hate speech". In America, you cannot be assured that you have the freedom to preach the unvarnished Word of God any more. But we must. Open-air preaching is not fun. Like the U.S. Army ads used to say, "It's not a job, it's an adventure!" I am routinely cursed and screamed at; I have had sodomites expose themselves at me and spit in my face; I've been assaulted. I hear God blasphemed. Some respond with interest and some with just anger. This is a ministry of seed-planting. But the measure of the success of this preaching isn't necessarily found on the day that it is preached. They hear the Word from me. They have been warned. They have been offered the knowledge of His saving grace. In the quiet of the evening when they lie in bed and ponder the thoughts of the day, they will consider that what they heard about themselves and God may be true. I don't see a large harvest. But that's not my responsibility. My responsibility is to show the TRUE love of God. It is not love to preach to sinners that they need only believe and come to Jesus ("for even the devils believe, and tremble"). The LOVING thing is to tell them the truth about how God actually sees them, and to show them what it takes for that to change; to show them what God expects in return for His eternal salvation. Many say that salvation is a "free gift" from God. It is free in the sense that there is nothing WE can do to obtain it; we only get it by God's grace, His unmerited favor. But it costs us EVERYTHING. We are bought with a price and belong to Him to do His bidding and not our own. THIS IS THE LOVE OF CHRIST. Unfortunately, there is so little church discipline and proper teaching about holiness and sin, that sin runs amok in the camp! And preachers who have hidden sins cannot effectively preach against it, because their heart condemns them as they preach. So they stay with the "grace, mercy and compassion" message instead of the "holiness, justice and judgment" message. They are both aspects of God's nature, but those who continue to practice sin and tolerate it within the church concentrate on one to the exclusion of the other. I believe that is why the American Christian Church is in the condition it's in. In American churches, we are not called upon to live holy lives, we are offered "counseling" for our "problems". We are not called to account for our sins. We offer cliches for our sin, such as "Christians aren't perfect, just forgiven" or "Be patient, God isn't finished with me yet". This is Bumper Sticker Christianity. We are NOT told that if we fail to conform to God's Holy Word and Law that we will be denied communion, or even the fellowship of other believers. This is what Paul demanded of the Corinthians, and of us as well. In failing to do so, we have let sin run rampant within the church, making her totally ineffective in calling the world to repentance. This won't change until we repent of our own sin, demand the same within the church and the church leadership and begin to preach boldly in the marketplace the true message of salvation.